Like a weather pattern that settles in and dominates a season, recreational boat sales stayed in their 2012 summer groove in August with increases among aluminum fishing and pontoon boats and smaller fiberglass outboards and declines among smaller fiberglass sterndrives, cruisers and yachts. The industry’s growth lagged the pace it set earlier in the summer, but sales in the main powerboat segments gained 4.7 percent, compared with August 2011, and industrywide sales rose 1.9 percent, according to figures compiled by Aarn Rosen, national sales manager at Statistical Surveys Inc.
“You’re past the backbone of the season and I’m sure the dealers are getting a little lean on stock, especially this year,” Rosen said. “Fortunately, you’re still seeing growth,” he added, encouraged by the trend as the typically lower-volume fourth quarter nears. 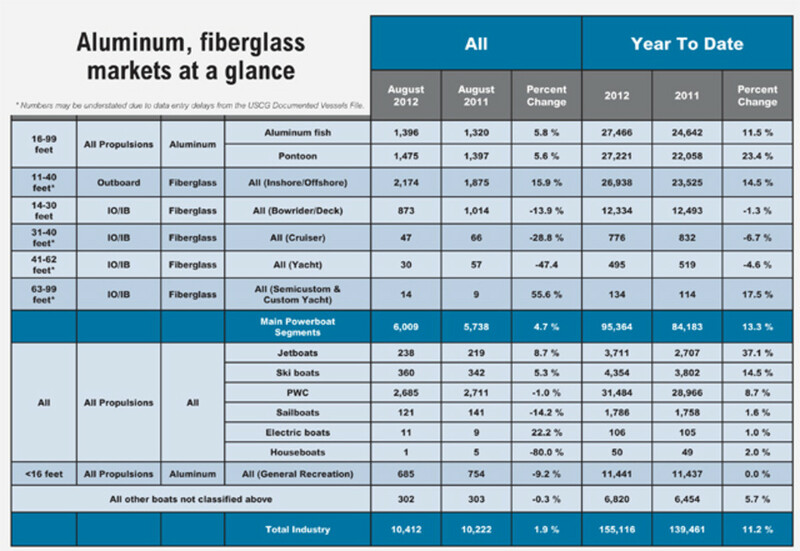 Through August, sales in the main segments, which consist of the two aluminum boat groups and five categories of fiberglass boats, are up 13.3 percent. Industrywide sales are 11.2 percent higher. As was the case in July, the high-volume 11- to 40-foot outboard fiberglass category outpaced all others in the main segments. Sales in that category rose 15.9 percent to 2,174 boats, and they are up 14.5 percent for the year, at 26,938 boats. In the aluminum categories, sales of fishing boats rose 5.8 percent to 1,396 and pontoon boat sales climbed 5.6 percent to 1,475. Pontoon sales are up 23.4 percent through August, at 27,221 boats. Earlier in the year the aluminum segments were producing the strongest sales in the industry. Rosen said the outboard category’s ascendance reflects improved markets in states such as North and South Carolina and Florida. “The Middle Atlantic states have begun to show their strength over the Rust Belt states,” he said. Conversely, sales in the 14- to 30-foot inboard and sterndrive fiberglass category were 13.9 percent lower, at 873 boats, marking the sixth month in a row that sales were flat or lower in that segment. Rosen said some key markets, such as New York, Detroit, Atlanta and Tampa, are showing growth in sterndrive sales, but not enough to change the overall trend. Among 31- to 40-foot cruisers, 19 fewer boats were sold in August than in the same month last year; 27 fewer were sold in the 41- to 62-foot yacht category. Among custom and semicustom yachts from 63 to 99 feet, however, five more boats were sold. The August data were based on information from 22 early-reporting states that comprise about 56 percent of the U.S. boat market. Rosen said August sales represent 9.3 to 10.7 percent of the total annual market. Reported sales of documented vessels were complete only through June 19 because of data entry delays at the Coast Guard, Rosen said, which means sales totals for boats 30 feet and larger are significantly understated in the data. “The sterndrives are still pretty soft, but I don’t think that the weakness continues into the larger inboard market,” he said, arguing that the gap between August 2012 and 2011 sales in the cruiser and yacht categories should close significantly once the Coast Guard catches up.